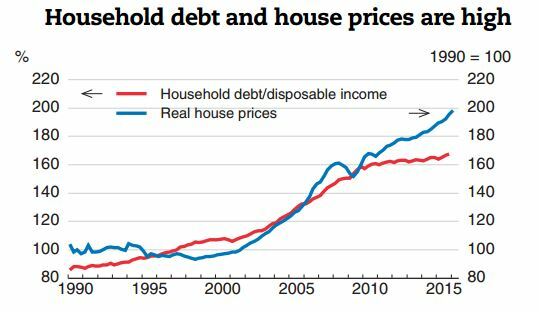 Global house prices remain “two-tiered”, says Global Property Guide. The “two-tiered” is reflected in house price increases in Europe and North America, while there is a sharp slowdown in Asia and the Middle East. Looking in more detail, during the first quarter of this year, “house prices rose in 31 out of the 45 world’s housing markets (…). [Also,] only 21 housing markets showed stronger upward momentum, while 24 housing markets showed weaker momentum. Momentum is a measure of the “change in the change”; simply put, momentum has increased if a property market has risen faster this year than last (or fallen less)”, according to the analysis done by Global Property Guide. The “two-tiered” view is also seen in the performance of house prices in advanced vs. emerging markets. Analysis by Scotiabank says that there is positive momentum in most housing markets internationally. However, momentum in general favours advanced nations over emerging markets. Asia and the Pacific: House prices are weakening in Asia, except China. House prices rose in China, Japan, Korea, Philippines, Thailand, and Vietnam. Meanwhile house prices are falling in Hong Kong, Indonesia, Mongolia, Singapore, and Taiwan (Global Property Guide). “China’s housing recovery is broadening, with roughly two-thirds of major centres reporting annual price growth through April. However, authorities face a tough policy balancing act in their attempt to cool skyrocketing prices in top-tier cities while at the same time support the nascent recovery in oversupplied smaller centres”, according to Scotiabank. On the UK EU referendum result, “For both residential and commercial property, there will be short-term market volatility. Potentially, and in selective instances, pricing could come under pressure (…) However, for both residential and commercial property, the long term market dynamics remain unchanged. Low supply will continue to be a day-to-day market reality”, says Knight Frank. Meanwhile, the Financial Times reports that on one end, buyers are pulling out of purchases amid house price and job security fears, while at the other end, overseas buyers race to secure London property bargains. Other experts have looked into what Brexit means for the U.S. housing market (Capital Economics, Housing Wire, NAHB, Trulia, and Washington Post). Middle East and Central Asia: housing markets are weakening. All of the three Middle Eastern housing markets included in the survey performed worse in Q1 2016 than the previous year (Global Property Guide). Western Hemisphere: North America’s housing markets remain healthy. The US housing market has now regained enough momentum to provide an engine of growth for the US economy, according to the latest The State of the Nation’s Housing report by Harvard Joint Center for Housing Studies. Meanwhile, Latin America’s housing markets are mixed. Brazil’s housing market remains depressed, while Mexico’s housing market grew stronger (Global Property Guide). Prime residential prices are moderating. Prime residential prices across the 35 cities increased on average by 3.6 percent in the 12 months to March 2016, according to analysis done by Knight Frank. 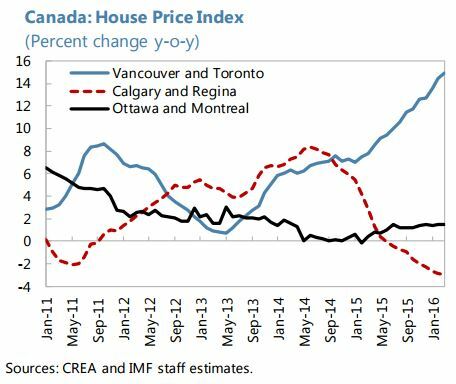 Knight Frank’s narrative of overall moderate growth in prime residential prices is also in line with the view of Scotiabank. “Sales of high-end luxury properties have cooled in a number of large markets over the past year, including New York, Hong Kong and London”, says Scotiabank. Looking in more detail, during the first quarter of this year, “house prices rose in 31 out of the 45 world’s housing markets (…). 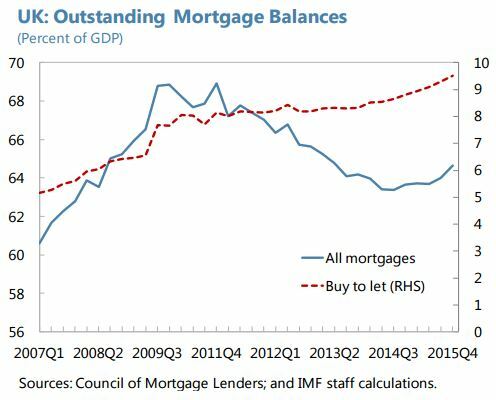 “Housing and mortgage markets have re-accelerated since mid-2015 (…) However, the recent acceleration in housing markets could partly be a temporary response to tax changes (…) Macroprudential policies will need to be tightened later this year if the acceleration does not prove temporary (…) The buy-to-let (BTL) segment, which has grown rapidly in recent years, needs to be put on an equal regulatory footing with the owner-occupied segment (…) Efforts should also continue to address supply constraints (…)”, says the IMF’s latest report on the United Kingdom. 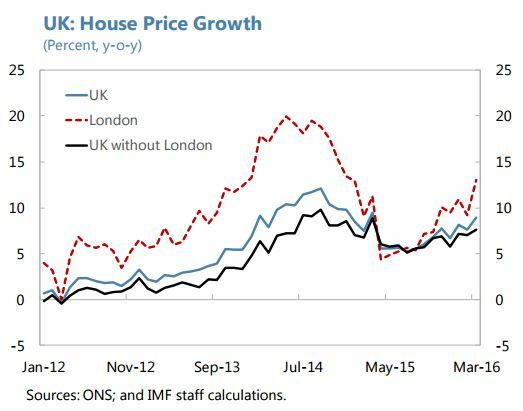 Also, see further discussion on recent developments in UK’s property market here. The oil shock has caused housing market trends to “trifurcate” (…). So far, there has been no contagion risk between the diverging markets. Alberta’s economy has contracted by an estimated 4 percent in 2015 and is projected to shrink by another 1.6 percent in 2016. House prices in Calgary and Regina have fallen by 3– 4 percent from their peak in 2014 and rental vacancies have quadrupled within the span of one year (October 2014–2015). The decline in house prices followed a massive housing market boom in the mid-2000s when house prices soared by 200 percent (2004–07). With little prospect for a quick recovery in oil prices in the near term, house prices in these regions are likely to continue to trend downward. Alberta and Saskatchewan account for 21 percent of total household debt (2012–14) and uninsured mortgages are non-recourse loans. 2 So far, strategic defaults have not occurred in any significant way. Consumer insolvencies have increased by 40 percent over the past year but remain small as a share of total loans (Figure 5). British Columbia and Ontario are expected to grow by 2–3 percent this year. House prices have been growing by 10–20 percent year-on-year, fueled by cheap borrowing costs, demographic pressures, land supply constraints and foreign demand. Ad hoc survey data suggest that in 2015 Chinese investors accounted for 14 percent of total sales volume ($9 billion) in Toronto and 33 percent of total sales ($12.7 billion) in Vancouver. In Quebec where the economy has been growing at about 1 percent, house prices (Montreal) have been rising at a more moderate pace of 1–2 percent. Quebec and the Atlantic provinces account for 24 percent of total household debt.